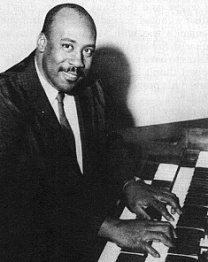 Earl Van Dyke (July 8, 1930 – September 18, 1992) was an African American soul musician, most notable as the main keyboardist for Motown Records' in-house Funk Brothers band during the late 1960s and early 1970s. Van Dyke, who was born in Detroit, Michigan, United States, was preceded as keyboardist and bandleader of the Funk Brothers by Joe Hunter. In the early 1960s, he also recorded as a jazz organist with saxophonists Fred Jackson and Ike Quebec for the Blue Note label. Besides his work as the session keyboardist on Motown hits such as "Bernadette" by The Four Tops, "I Heard It Through the Grapevine" by Marvin Gaye, and "Run Away Child, Running Wild" by The Temptations, Van Dyke performed with a small band as an opening act for several Motown artists, and released instrumental singles and albums himself. Several of Van Dyke's recordings feature him playing keys over the original instrumental tracks for Motown hits; others are complete covers of Motown songs. His 1967 hit "6 by 6" is a much-loved stomper on the Northern soul music scene. Van Dyke played the Steinway grand piano, the Hammond B-3 organ, the Wurlitzer, the Fender Rhodes, and the celeste and harpsichord. He played a toy piano for the introduction of the Temptations' hit, "It's Growing". 1969: "Run Away Child, Running Wild"
(**) billed as "Earl Van Dyke & the Motown Brass"
U.S. Motown MS 631 (H-1354) (1965). Album produced by Stevenson, Cosby and Fuqua. The vinyl record attains a strong excellent grading, suggesting few plays. The album comes with a generic, plain white, paper inner sleeve.